For years thermostats have been ugly and downright stupid devices that sit neglected on our walls. But over the past 18 months the connected thermostat has morphed into a gadget that has been drawing the attention of some of the most cutting-edge software startups, which are looking to use it to connect with utilities and consumers. Unbeknownst to many, a Canadian company in Ontario, Ecobee, has been at the forefront of the smart thermostat market for quite awhile. The Ecobee device is fully integrated with the Internet, and does all of the things you might expect an Internet connected thermostat to do, using your smart phone while away in Zanzibar to monitor your home. I quite like Ecobee. But it would be another Canadian innovation tragedy if Ecobee got run over in this growing global battle, as has happened with so many Canadian companies. I would be happier to see Ecobee begin acting like the global market player it is, attracting major capital and Big Dog strategic partners. But the market has been heating up for some time and many major technology players and lots of big Silicon Valley money are now in the fray. A BC Hydro trial of advanced Smart Grid, solar heating, and Smart Meter (called Advanced Meter Initiative or AMI in BC) technologies has been going on quietly for some time on Vancouver Island. Another FortisBC trial is due to begin in the Okanagan sometime in the near future. Home energy management networks are set to grow from being in 2 percent of U.S. households in 2011 to 13 percent, or about 16.2 million households, by 2015. Cisco Systems, General Electric, Google, Honeywell, Microsoft and Intel, along with a host of other companies are now focused on this home energy management market, developing new products and technologies that will be in our homes shortly. Siemens spin-off startup, EnOcean, and the EnOcean Alliance are also part of this complex market mix. EnOcean is the current leader in a related technology, “energy harvesting”, which will likely be one of the future major drivers in energy efficiency. Many home appliances are already “Internet ready.” This is obviously an area of major global corporate competition. So take another look at that ugly thermostat on your wall. Things are about to change. For the record, I am not impressed with all of the Luddite hype opposed to smart meters. One of BC’s environmental celebrities (not David Suzuki) is an opponent of wireless smart meters, citing anecdotal research on the health dangers of radio waves generally, but not on smart meters specifically. On the one hand, this person decries climate change deniers who refuse to accept science, while he simultaneously denies science on radio signal propagation. I follow this area of research fairly closely and have yet to see any convincing study that points to health problems with the radio signal propagation of smart meters. I am a follower of Nikola Tesla, the recently resurrected “father of electrical energy generation and distribution”, who endeavored to dispel superstitions about electricity. Unfortunately, many of those superstitions persist. A Khosla Ventures-backed energy analytics startup called Bidgely is the latest to go after the next-gen smart thermostat, and it has told us that it has an agreement with thermostat maker Emerson to commercialize a thermostat in the coming months that syncs with Bidgely’s energy software. Bidgely’s algorithms can take home energy data and section out which appliances in the home are consuming what amount of power, without having extra hardware or sensors on each plug or appliance. Consumers that can get that type of data can see, for example, if their pool pump is consuming too much energy in the winter time, or if their air conditioning unit is sucking down much more power than the average (see itemized bill). Utilities could offer such a smart thermostat to customers in their areas that want to be included in energy efficiency programs. Emerson’s thermostat wirelessly connects to smart meters or a home router with a Zigbee connection. The deal between Emerson and Bidgely isn’t all that unique in the rapidly growing energy software sector. Emerson is also working with other software startups like EcoFactor, EnergyHub, and Calico Energy to have its thermostat sync with their software, too. Next week at a major utility conference called Distributech, all of the energy software startups and large energy giants will be touting their smart, connected thermostats; including both new thermostat models and new services. The thermostat is a unique device. It’s an object that can provide demand response services for utilities, or the collective turning down of utility customers’ energy use during peak times (like a hot summer day in Texas). Software startups like EcoFactor can create algorithms that can do this, without making the climate of a home uncomfortable for the inhabitant. 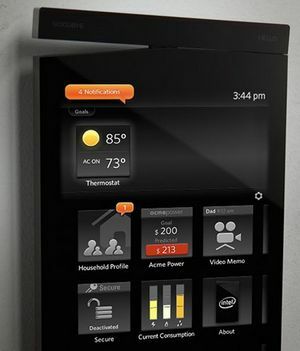 The thermostat is also the latest device to become part of the growing world of the Internet of Things. In this always-on connected ecosystem, everything gets a connection, all devices are made smarter with software and data and these devices can make human lives easier, more interesting or more efficient. Nest is one of the few that’s aggressively targeting consumers. Most of the energy startups are aiming for the utility market. One of the better known collaborations around a thermostat maker and an energy software company is between Opower and Honeywell. 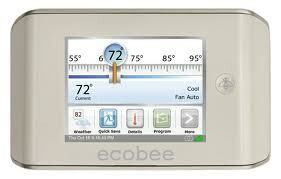 Honeywell is the giant in the thermostat maker market, and Opower is the leading energy software player. Make sure to watch the buzz around smart thermostats and the entire market area defined by energy efficiency monitoring and management, in both commercial and home applications.